I really like worn guitars, well it’s hard to avoid when most of my guitars are 30-40 years old, the oldest guitar I got is my little Levin from 1942. However, there is one thing that I can’t stand, marks and dents on the back of the neck. Some little imperfection that you feel every time you move you hand up and down the neck. I’m not sure if it’s related to my slight OCD but it annoys me so much that I tend not to play any of my guitars that doesn’t have perfect smooth necks. The worst used to be my Greco Les Paul, it had a dent in the neck and I complained so much when I bought that I actually got it cheaper. When I received my Goya T-18 and my Morris W-40 and realised that they both had really bad marks on the back of the neck I just wanted to cry. Then I thought about it and came to the conclusion that I can’t be the only one that has issues with this, so I checked some Youtube videos to learn how to fix it and then ordered everything I needed. 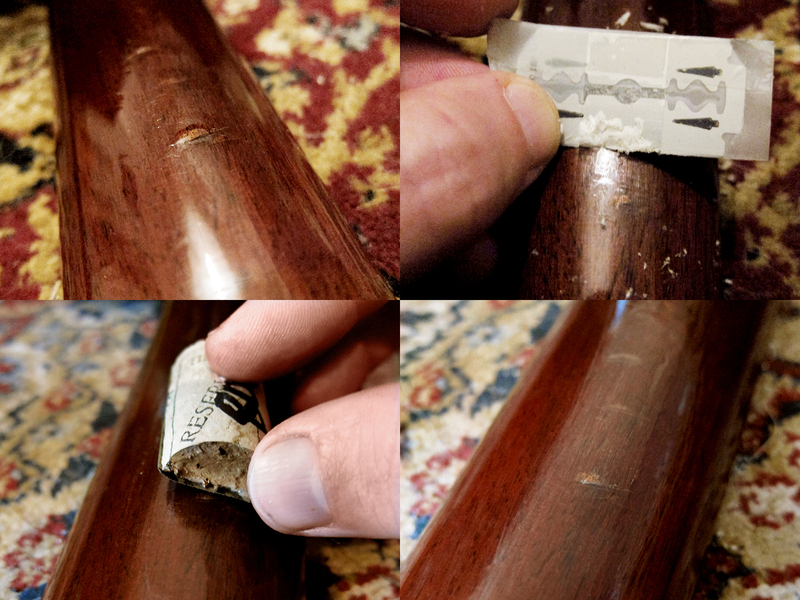 It’s actually really easy to fix yourself, well as soon as you find good lacquer and sandpaper with a grit fine enough, that turned out to be impossible around here. 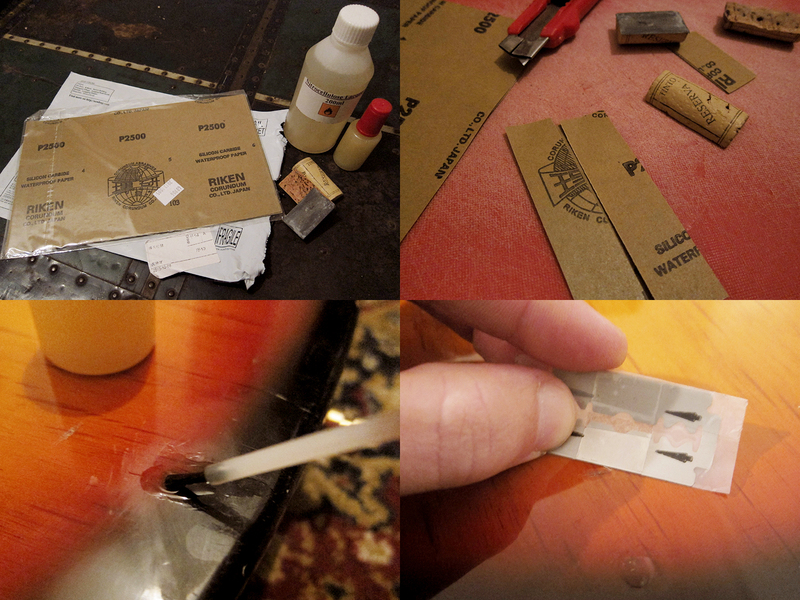 I managed to find a eBay seller that sold Nitrocellulose lacquer fairly cheap and was willing to ship to Spain. The sandpaper I had to order from China, I couldn’t find anything finer than 800 in Barcelona. After a months waiting and some feeble practice runs on less loved guitars I was finally ready to try to fix all dents, marks and imperfections on the back of my guitar necks. It went really well, or as well as it could with just 2500 grit, ideally I would have liked to have something much finer for really getting the shine back, especially on flat surfaces like bodies, the necks looked pretty good anyway. Before I started on any necks I decided to practice on the fairly roadworn body of my old Claescaster. The sandpaper I ordered from eBay came in 1500, 2000, 2500 grit and actually turned out to be made in Japan. I cut wine corks in half and glued sandpaper strips to them to get a straight sanding surface, remember to mark the grit on them otherwise it gets a bit confusing. Next step, apply the lacquer. It dries pretty fast, about 10 min, which is good because you normally need to apply lacquer more than once to really fill the dents. When it’s dry just cut off the access with a razor blade until the surface feels smooth. It’s good to tape around the blade, not only to avoid cutting yourself, but also to not scratch the surrounding surfaces. Remember to dip the sandpaper in water before you start sanding, you can really feel the difference especially with the finer grits. I used 400, 800, 1500, 2000 and 2500 grit on my little wine cork sanding blocks. I would have loved to have something even finer. I tried everything I could think of that could have a bit of sanding effect but was finer than 2500 grit. Pencil eraser, sponges, different cloths, in the end I rubbed really hard with metal polish which seemed to work a bit. As a last step I applied a bit of Carnauba wax and a lot of elbow grease and then buffed it up with a fine microfiber cloth. This is the back of the neck of my Morris W-40. The seller didn’t even bother to mention that it had deep cuts in the neck. This took quite a few fills with lacquer to even out the dents but in the end it worked pretty well. You can still see a slight colour change but you can’t feel the dents, which was the main thing for me. The last photo is not of the final polished result, it’s in the middle of sanding, I forgot to take a picture when I was done. I’m very happy with the result on all of the guitar necks I tried to fix. 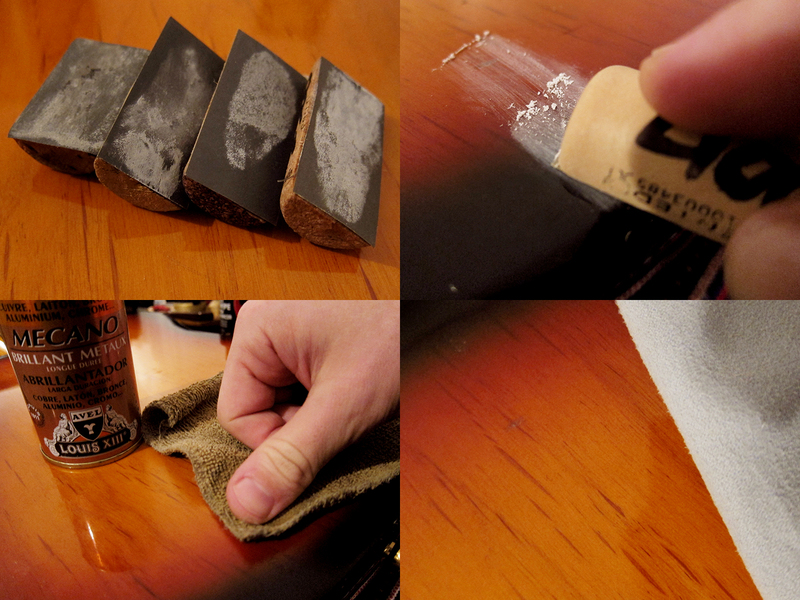 It was also a lot easier to get the sanding smooth and unnoticeable on the back of a neck compared to a guitar body.